Leaves Deeply Cleaned machined and help to remove bad odors. Prolong the life of your dishwasher and washing machine by using Oust every 3 months. No more dingy clothes or residue left on your crockery! 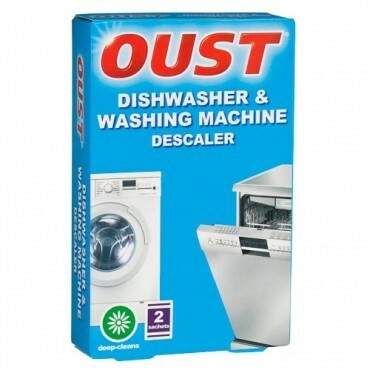 Removes limescale, food and detergent deposits from dishwashers and washing machines. Saves on electricity and extends the life of the appliance. Regular use means limescale preventatives do not have to be added to every wash.
2 sachets in a pack. Empty dishwasher and pour the contents of 1 sachet onto the bottom of the machine. Select and run a normal program without pre-wash. Empty washing machine and add the contents of 1 sachet to the drum. Select and run a 60 C cycle without pre-wash.
After cycle has finished, wipe around door seal with household cleaner on a damp cloth or sponge.